As reported elsewhere I was fortunate to visit Kidderminster last Sunday and buy some different Euro20/World10 Faststamps from the Wincor machine in the WHSmiths branch*. It seem unlikely that any more new stamps will now be found (other than Winter Greenery perhaps) so it is a useful time to summarise and link to the stock we have on our shop. Click on the image to go to that stamp in the shop, and click on Recent Additions when there to see the others - while stocks last! Also reported but not yet stocked by us, Cattle, Union Flag and possibly other Freshwater Life. The intention was for Symbolic Flowers to be followed by the Poppy and then, on 13 November, to be replaced by Winter Greenery. Maybe some offices didn’t receive the information and therefore didn’t order the stock. This indicates that the PO Supplies Department at Swindon is not sending the stock out automatically (although I think they ought to for new issues). 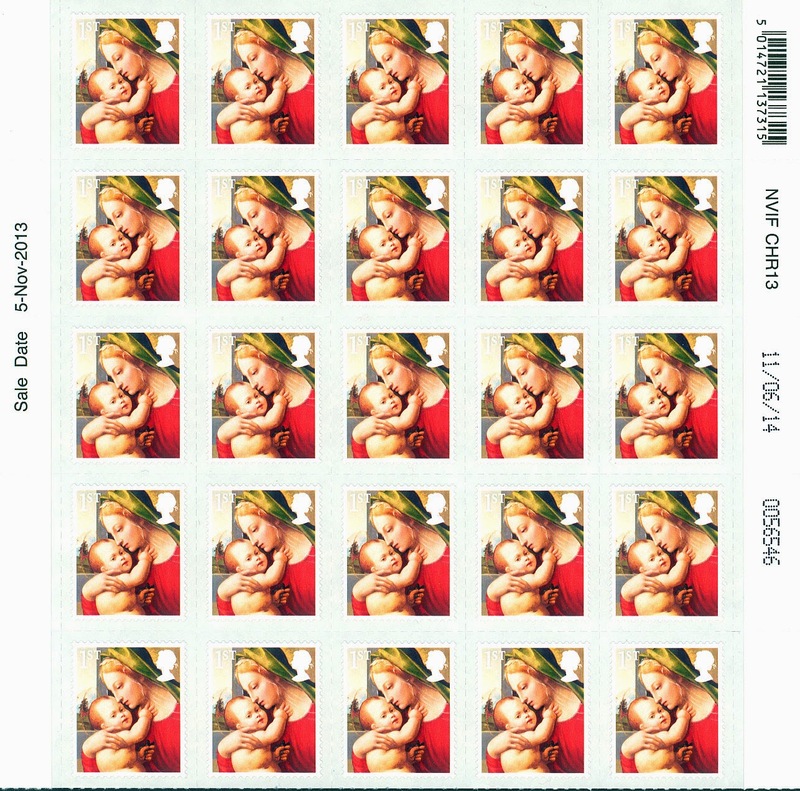 If we are reliant on individual branches ordering new stamps then it may be difficult in the future to be sure what will be on sale where, unless concerned collectors and dealers approach the branches a couple of weeks before a new issue is due. Even then, it's reported that NCR offices, which mostly have at least 3 machines, received two rolls of Poppies and then were unable to order any more, meaning that some have no Poppies on sale in the period immediately before Remembrance Day. * For those visiting Kidderminster, the branch is about 150 yards from The Bullring, where you can also find J D Wetherspoons Penny Black pub which serves a good all-morning breakfast and Sunday Roast! I checked Norwich's stock of definitive-sized Lest We Forget Poppies stamp on 21 October and found that they had a 2013 printing. 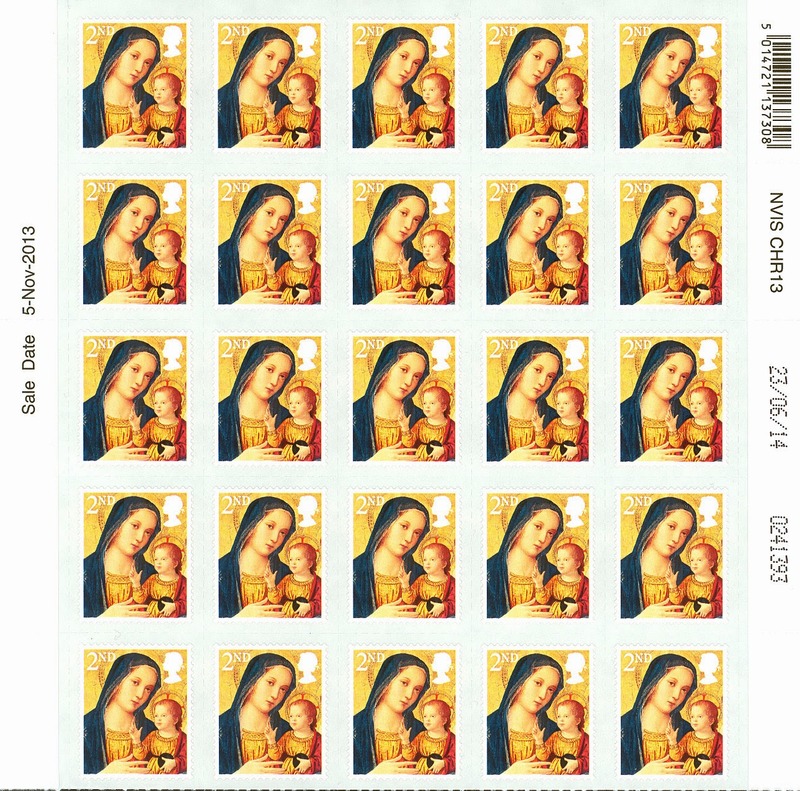 However, the 1st and 2nd class 2013 Madonna Christmas stamps are also reissued this year (the 2007 stamps having been retired), and the ones that Doug has sent pictures of are new 2014 printings, 11 June for the 1st class, and 23 June for the 2nd. Thanks to John F for pointing out that on the examples he has seen the date in the phosphor is still ‘2013’ for both first & second class. This points to the same cylinders being used and means that there will be no new catalogue entry for these. However, it doesn't mean that there will be no shade variations, as happened with the various printings of the previous long term 'alternative' Madonnas.